This blog explains the rationale for the zero point survey1–3. This starts before the primary survey that we are all familiar with and is a means of optimising the performance of resuscitation teams in critical care situations. The zero point survey is the brainchild of Cliff Reid, a prehospital and emergency physician from Sydney Australia. Cliff was kind enough to involve clinicians from around the world in developing the concepts around the ZPS into an open access publication appearing in Clinical and Experimental Emergency Medicine4. Almost all resuscitation courses and strategies start with the primary survey. The ABC or (C)ABC approach of resuscitation is well established and familiar to us all, but that’s not where resuscitation really starts. In almost all cases there is a time period before we make contact with the patient when we have the opportunity to prepare and thus influence the effectiveness of ourselves and the team when we first make patient contact. The range of time available may be very short (as when running to a cardiac arrest in hospital) or prolonged (for example when waiting for a patient to arrive in the ED from a prolonged prehospital transport). In either case the clinicians involved in the resuscitation have time to organise in order to optimise resuscitation. The primary survey, essential though it is, fits within a wider approach to the initial resuscitation team’s actions. The ZPS uses the STEPUP acronym and is shown below. Arguably the ZPS is a focus on the STE elements of STEPUP. The ZPS starts as soon as knowledge of the need for a resuscitation becomes available. It describes a structured approach that recognises the importance of self, team and environmental factors in preparing for and delivering a successful primary survey and subsequent resuscitation. I have heard a suggested modification to STEPUP to include an extra S to create STEPSUP, with S standing for Synthesis. I think this works as it is an essential requirement before developing and sharing the mental model in the Update section. Either acronym is acceptable to me. Arguably we can trace the origins of ZPS back to Cliff’s presentations on ‘Making Things Happen’ in the resus room. I still think this is one of the best SMACC talks ever as its certainly been one of the more influential ones to my practice. If you’ve not seen it before then I would recommend you spend 20 mins or so watching the link below. You will not be disappointed. You’d perhaps think so, but it’s not. I regularly see teams preparing for patient arrival without thinking and optimising their approach to that first patient contact. Examples might include. It is arguably no more obvious than ABC itself, but just as important. We have noticed the role of ZPS in insitu sim sessions in the ED. We start a lot of our scenarios with a standby phone call (as that is typical of how most of our most severely unwell patients arrive). We brief the team via the phone (as is normal practice) and then ask them to assemble a team prior to the simulated patient arrival. This period of time before the patient arrives is analogous to the time of the ZPS and we spend a lot of time in the debrief analysing and discussing this part of the resuscitation. Most importantly we recognise that a successful resuscitation starts before the patient arrives. We also know that teams are often put together at short notice and they won’t know each other well. We are increasingly working not in established teams, but in ‘Flash teams’ who may struggle to share the same mental models unless they are explicitly developed and shared. The ZPS promotes the regular sharing of mental models which should improve patient resuscitation. In many cases we pause the sim session just prior to the patient arrival in order to do a focused debrief on the ZPS elements. We then offer an opportunity for the team to correct any omissions, optimise their ZPS processes, and then we proceed into the patient contact component of the sim session. Whilst it is not common practice to interupt the flow of a sim session in this way we feel that it is vital to explore and understand the preparation and prediction of a resuscitation scenario. This practice has transformed the performance of our resus teams who now spend time exploring self, team and environment prior to patient arrival. They are encouraged to predict and prepare for what might happen based on the limited information available from the standby call. Whilst I cannot prove an improvement in patient outcomes the feeling is that resuscitations run more smoothly and competently when the time before patient arrival is valued as ‘golden time’. In my opinion the ZPS should be integrated into all resuscitation teaching and training. I would love organisations such as the Advanced Life Support Group5 and The Resus Council 6 to consider implimenting it in their courses. That may sound fairly bold, but as those organisations have begun to include human factors elements into their courses then a more explicit system such as ZPS which shows how human factors incorporate themselves into the flow of resuscitation. Courses such as the European Trauma Course (according to Dan Horner as I’ve not personally done it) already include apre-arrival checklist and I suspect that some of the other more recent and agile courses probably do too (I’ll bet ATACC probably does), but the lack of a common language perhaps prevents widespread adoption and a commonality of process. There is often great purpose in giving something a name. As an author on the paper I am clearly biased, but I do think that Cliff and the team have articulated best practice in resuscitation. If you are doing this already then great, if not then please have a read and consider putting it into your daily practice. If you feel this is obvious to you, then that’s also great. 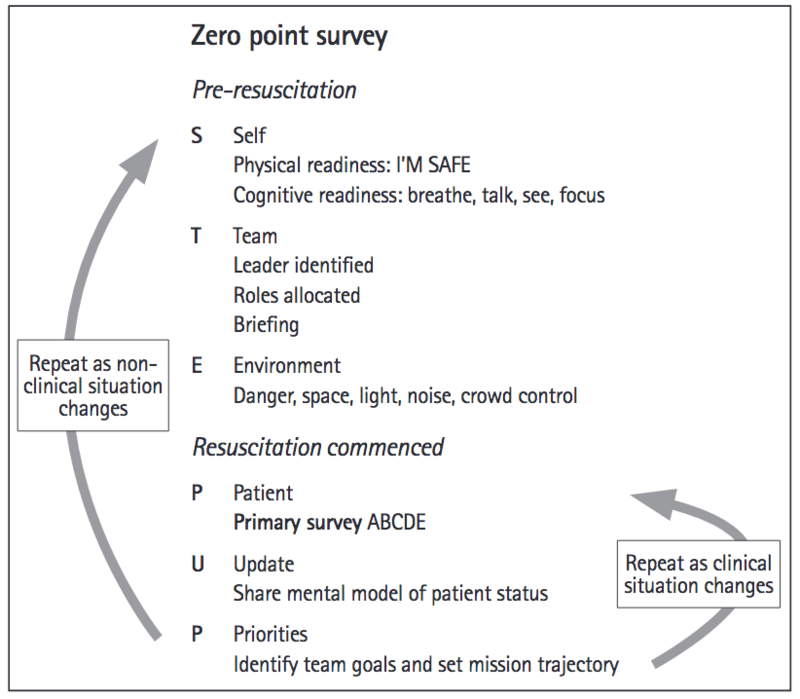 You don’t need to change, but consider using the ZPS/STEPUP model to teach your trainees and resus teams such that you an all perform to the same level. Footnote on the allocation of roles. Does this sound familiar? Me: Are you happy to do defib tasks? Me: …. but you are happy to use it? Me: Has anyone else actually been trained and is confident AND is COMPETENT to use the defib? To be a bit tribal about this. I often find the docs are overconfident in their abilities to use kit and the nurses are underconfident in putting themselves forward. Resus teams are multiprofessional and we should use the most competent people for the resus and then teach those who need extra afterwards. Spending time in the ZPS to establish competence and confidence is rarely, if ever, wasted. 139 Copyright © 2018 The Korean Society of Emergency Medicine Zero point survey: a multidisciplinary idea to STEP UP resuscitation effectiveness . CEEM. https://www.ceemjournal.org/upload/pdf/ceem-17-269.pdf. Published 2018. Accessed September 30, 2018. Reid C. Zero Point Survey. Resus.Me. http://resus.me/analysing-resus-1/. Published 2018. Accessed September 30, 2018. The Zero Point Survey. CEEM. https://www.ceemjournal.org/journal/view.php?number=189. Published 2018. Accessed September 30, 2018. ALSG Home. ALSG. http://www.alsg.org/home/. Published 2018. Accessed September 30, 2018. Home Page. The Resus Council. https://www.resus.org.uk/#. Published 2018. Accessed September 30, 2018. Next: Next post: #stemlynsLIVE programme update and Livestream. I had a strong feeling that the ETM course and yourself would be all over this Tim. I think that talk by Cliff was highly infuential and the STEPUP/ZPS aspect is really putting a name and a strucutre to that process. Yes I like the clarity of the ‘capable and competent’ phrasing as opposed to the ‘happy’ version. I’ll incorporate that in the talk tomorrow. This seems to be a very useful upgrade of the STEP mnemonic from TeamSTEPPS (also the source of I’M SAFE). I wondered why no mention of TeamSTEPPS in the paper or this blog. A further refinement that may be of help (learned from my neighbour who is a Royal Marine, though I think it’s more widespread in the UK military): the one-third: two-thirds rule. Split any time you have for preparation into thirds, spend the first third planning and the remaining two thirds physically doing stuff like getting equipment etc. Thanks, the issue of timing in the ED is that we have no control over the preparation time. You get given what you are going to get!